Why would someone play small in the first place? When we are involved with a narcissist, we are conditioned to play small. The narcissist needs to feel powerful and superior in order to assure his or her false self that their grandiose self image is correct. The narcissist is likely to fly into a rage or to punish us if we say or do the slightest thing that could threaten this false self image. As a result, we end up living our lives as though we are treading on eggshells. Playing small comes from an underlying, subconscious need to keep ourselves safe. This is a very strong and powerful instinctive human need. When the narcissist had power over us, we had to play small in order to be safe. If we dared to ever feel good about ourselves or do something for our own good, it is likely that the narcissist would have lashed out and punished or hurt us in some way. As a result, we become conditioned to play small to prevent this from happening. This process is mainly playing out in the subconscious. 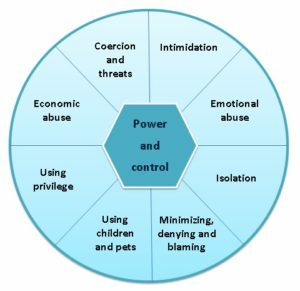 Playing small may serve us when we are involved with an abuser. However upon leaving the relationship, we may discover that this conditioning is hindering us, rather than helping. The steps below and the accompanying video, explain how we can learn how to feel safe to take up space in the world and to be our authentic selves. How do we Overcome the Conditioning to Play Small? 1. The first step to overcoming this conditioning is to be aware that we are playing small. 2. I would then encourage you to take small steps or risks that involve breaking the pattern of playing small, however that may look to you. When you do this, some inevitable blocks and fears (possibly even terror) will arise inside you. 3 I would encourage you to really focus on how your body feels when this happens and to notice the sensations in your body. Take a moment to acknowledge and honour how you are feeling. I normally journal about it, as I find this helps to bring the emotions and feelings to the surface and to be expressed in a safe way. 4. The sensations and feelings are crying out to be heard. 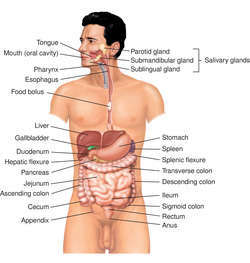 They will be stuck in our bodies and will keep coming up until we really feel them and listen to the message that they have for us. The change comes from the inside. When we can compassionately and lovingly come home to ourselves then we can heal the blocks that are stopping us from living full lives. Then we will find that we are increasingly free to gain traction in our lives, without having to constantly battle against the conditioning that the abuser has instilled into us. It is an ongoing and gradual process that takes time. We need to train our bodies to realise that it is safe to take up space in the world. I would love to hear your comments. Please feel free to get in touch and let me know of any topics that you would like me to cover or any questions you may have. Those of us who end up with narcissists are often highly empathic people. We have a strong desire to know the truth and for the truth to be known. We care about the other person’s feelings. We absorb the feelings of those around us and we feel their pain. We want to caretake others and to rescue them from their pain. Although these are great qualities to have, they can be taken advantage of by narcissistic individuals. A narcissist will typically target empathic types. This is because empathic individuals provide them with narcissistic supply. The narcissistic also knows that they are likely to be able to use the target’s kindness to manipulate them. 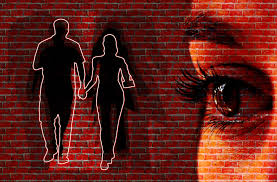 This dynamic of the empathic person wanting to caretake and rescue the narcissist, who in turn wants to manipulate and control the empathic person, means that we find it very difficult to walk away from these relationships. We may feel as though we are going around and around in circles, with no way out. The way this manifested in my life is that the narcissist would do something so malicious and hurtful, that I would be in extreme pain and distress. This would give me the strength and determination to leave. A certain amount of time would pass, during which I would be working on moving forward in my life. Then, just when I least expected it, the narcissist would again enter into my field of awareness. For example, they may have turned up at a place where they knew I would be or they would send me a message, either directly, or through a third party. The net result would be that I would be feeling concerned that the narcissist was feeling sad and hurt because I left them. This is likely to have been precisely how the narcissist wanted me to feel. As we know, they are experts in manipulating others to feel a certain way, without us even being aware of quite how they have done it. I will take on board the feeling that I was to blame for the narcissist’s pain and therefore I would feel a strong urge to fix it. I would also want the narcissist to understand and to see the truth – then perhaps we could live happily ever after. This would lead me to consider getting back in touch with the narcissist. Perhaps this time it will be different?? No! The REAL truth is that the narcissist is not going to change or to see the errors of their ways. Sadly they believe, (largely subconsciously), that manipulating others is the only way to be safe in the world. Deep down we know that if we approach the narcissist again, we will be hurt again, and the cycle will start over again. 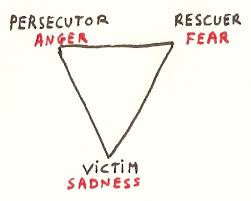 This can be described as the drama triangle. When I take a step away from the narcissist after he has done something unacceptable, he plays the victim. This leaves me feeling as though I am the persecutor. Therefore I want to rescue the narcissist from this position. However he then moves into the position of persecutor and I am victim. 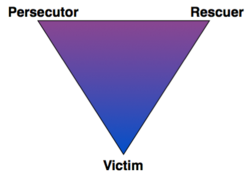 There is no one rescuing ME from the victim role. Therefore the only way for me to get out of the victim role is to leave – and stay away! The bottom line is that this situation is never going to turn out well for you. By rescuing the narcissist, you are effectively sacrificing yourself. The narcissist will always be the winner, for no better reason than the fact that there is no limit to how low they will stoop in order to get what they want. A narcissist cannot function in a normal relationship. They need to steal energy from another person in order to feel alive and therefore they need to create chaos! If you give the narcissist another chance, they will not thank you for it or treat you any better. In fact, their respect for you will decrease and they will know that they can get away with treating you badly. You show them your standards by your actions. Your only option is to not play their game. Do not be fooled by their act. It is the narcissist’s choice to be unhappy and there is nothing you can do to change that. The best hope you have is to shine by example and focus on your own health and wellbeing. Please leave a comment in the box below if you have any experiences of finding it difficult to gain closure. What obstacles have you found and what have you found helps? Look forward to hearing your comments. When we are troubled by an emotion, we need to ‘digest’ it in the same way that we would digest our food. We acknowledge the presence of the emotion. Next we work out what the emotion is trying to tell us. Journalling may help here. We can then work out what we want to do as a result of acknowledging this feeling. There may be an action we need to take, or there may be a change that we want to make in our thinking or approach. Here’s an example: The other day I started the day feeling relaxed and at peace. By the end of the afternoon, my serenity had gone completely. I left work and went to the supermarket. While at the supermarket, I felt BAD. I felt fearful, as though I was about to be punished somehow by the universe for being BAD. A colleague on my team had left a lot of work for me to pick up that she should have completed the previous day. This was the second week running that something like this had happened. A colleague on another team shamed me for speaking up for myself. I had to deal with another difficult issue that the colleague on my team should have dealt with the previous day. I started to feel shooting pains in my arms from the volume of work and the repetitive tasks that had been left for me. I sensed myself feeling irritable and had started to self punish and shame MYSELF for being irritable, as though feeling irritable was a flaw. I ended up sitting at work with a sense of doom, as though the world was closing in on me and as though everyone was looking at me with contempt. In fact the feeling or irritability was a signal from my body that was trying to make me aware that I was being pushed around. My feelings were telling me to question the colleague who had left the work. However my thinking mind kicked in and told me that I would not look like the perfect worker that I wanted to be perceived as if I spoke up. The irritability increased to anger over the course of the day and I had no outlet for it. The end result was that I had turned it in against myself and was now in the supermarket, carrying the feeling that I deserved to be punished. Once I recognised this, I was able to realise that I was automatically replaying a childhood pattern. As children, we have an innate sense of injustice. If I ever dared to speak up to my primary caregivers against a perceived injustice as a child, I was punished. Being able to recognise that my present reaction and behaviour was a survival pattern that I no longer needed, I was then able to relieve myself of the feeling that I deserved punishment. The emotion of fear was then able to leave my body and I could relax. This is where getting in touch with our inner child helps. Instead of berating myself for how I had failed to speak up and deal with the situation at work, I could take a self compassionate approach. I saw it as a learning opportunity, which had been sent to me, to help me clear the childhood wounds that have been causing me pain. Next time a situation like this occurs and the same feeling of irritability and injustice comes up, I will be able to recognise that I have choices in how I respond. I can analyse the situation and work out what the best course of action is for me to take. This will be a way for me to regain the power within myself that was taken away from me during childhood.